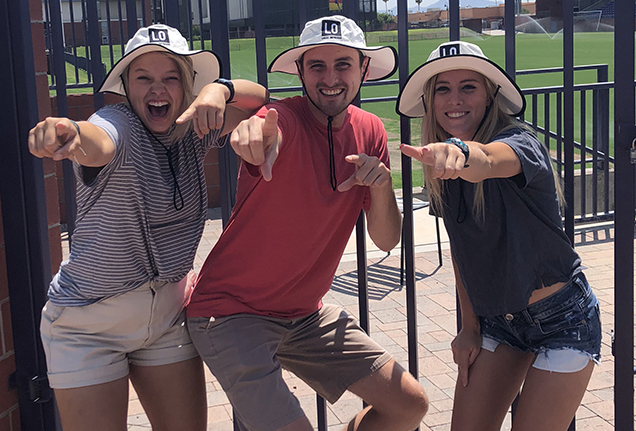 From left, Stephanie Johnston, Joshua Larson and Sarah Barber show off their Local Outreach bucket hats in preparation for Welcome Crew Move-In efforts. 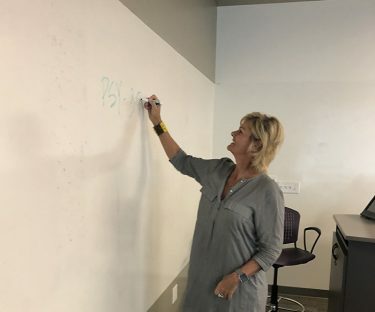 When Dr. Julie Nelson brought her daughter, Karley, from their Utah home to Grand Canyon University 10 years ago, she was struck by the friendly, caring atmosphere on campus. On Friday, she hopes to replicate that atmosphere in a volunteer effort that begins at 6 a.m. The psychology professor in the College of Humanities and Social Sciences will work alongside faculty, staff and student leaders to move in the Welcome Crew, the group of students who in turn will move in their peers next week. Dr. Julie Nelson looks forward to meeting students in class AFTER she helps move them in. Nelson, who teaches health psychology and probability and statistics, among other classes, envisions making connections with students who remember her efforts to ease Move-In by swarming their cars, unloading the contents onto speed pack carts and gently placing them inside their residence halls and apartments. 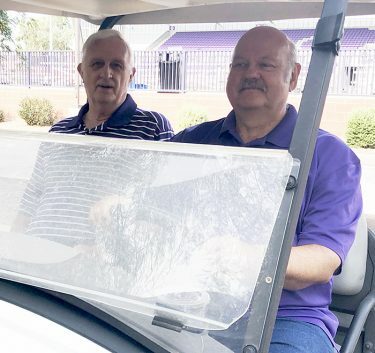 Dennis Sorensen and Bill Yearnd represent another thread in the fabric of Lopes’ Move-In Community. For the past six years, they have provided water, Gatorade and snacks to adult volunteers such as Nelson. The eyes of thirsty volunteers light up when they see the “water boys” approaching in their golf cart. Sorensen drives and Yearnd handles the map and the schedule, navigating through tight areas. “Sometimes I have to drive backward. It is a challenge,’’ Sorensen said. To stay on the move, traversing all areas of campus, the pair developed hand signals. Bill Yearnd (left) and Dennis Sorensen, the “water boys,” are a welcome sight for thirsty Move-In volunteers. As the campus has grown, so have their responsibilities. Initially, they volunteered for three days; now they help for six days, beginning Friday and continuing Monday through Aug. 24. They communicate with Welcome Programs staff via walkie talkie and regularly leave campus to provide sustenance for police officers and security working on perimeter streets. The pair, who have combined for 22 years working for the University in business analytics, also provide relief for volunteers on traffic duty who need an occasional break. No job is too messy for the “water boys.” They even pick up trash since some of the volunteers cannot abandon their posts to toss out Gatorade bottles or snack wrappers. “It shows that here’s a couple of adults willing to pick up trash, that are willing to service other people, students, as well as adults,’’ Yearnd said. In the spirit of servant leadership embraced by GCU, the pair makes decisions on the fly. For example, they ran across a grandparent who was trying to make a lengthy walk in the heat. Yearnd gave grandma his seat and waited patiently in the shade while Sorensen delivered her across campus to her grandson. 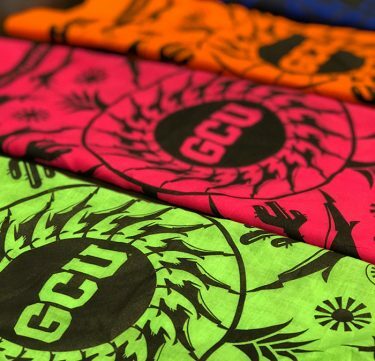 Colorful bandanas will keep the perspiration off the faces of volunteers. Along with several hundred employees lending a hand at Move-In, members of the Thundering Heard Pep Band, Cheer, Dance, the Havocs and women’s softball, basketball, volleyball, beach volleyball and baseball teams are volunteering along with student leaders from various clubs and organizations. For senior Sarah Barber, lending a hand is part of the GCU freshman-to-senior cycle of college. “When I was a freshman I loved having people come and move me in, so I want to give back what they gave to me, and it is so fun,’’ she said. Senior Joshua Larson also wants to start the newcomers on a positive vibe. Just last year Stephanie Johnston was waiting in the line of cars, anxious to meet her roommates. In an ongoing effort to improve upon one of the greatest college transition traditions, Charity Norman, Director of Welcome Programs, has devised a few ways to show appreciation for the growing number of students who volunteer for the Welcome Crew. Along with an appreciation dinner, which was added last year, they will have a pool party and a movie night. Stickers differentiate among volunteer types. “It’s just us having another opportunity to say thank you and get excited for Welcome Week and we’re real excited you decided to join us,’’ said Norman who expects 1,100 student volunteers, 300 faculty and staff volunteers, and 18 alumni. 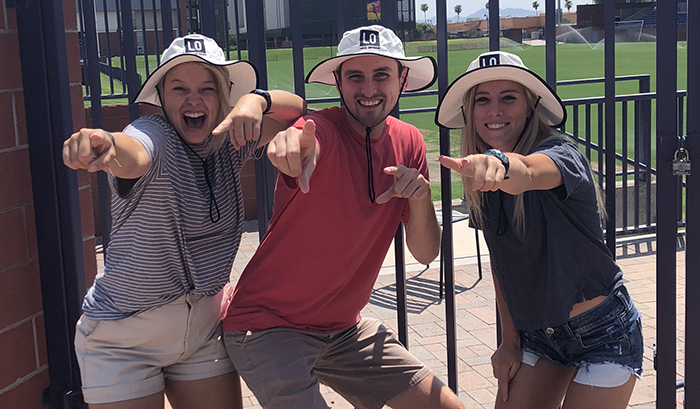 The student Move-In volunteers are scheduled to attend a training session Saturday designed to emphasize the procedures of carefully moving items from car to room without loss or breakage while infusing them in the welcoming culture of GCU. The training session includes activities and games to increase the familiarity within volunteer groups and to organically develop leaders. For the first time, Norman will have a training co-host, Erik Nelsen, the New Student Programs coordinator. Specifically for Welcome Week, as the volunteers coordinator, Nelsen has prepared a gift package. 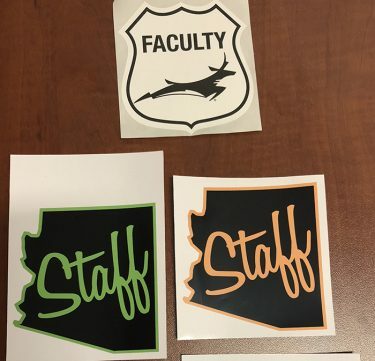 To differentiate staff and faculty from students, Nelsen ordered special stickers for staff and faculty to wear on their T-shirts. Indeed it is — and it’s neat for the professors as well.